Outstanding FE and skills achievers have been honoured at FE Week’s Festival of Skills for this year’s City & Guilds Lion Awards. The stunning grounds of Capel Manor College, in North London, was the setting for the ceremony this evening (June 7), hosted by BBC breakfast and Celebrity MasterChef presenter Louise Minchin, to recognise the efforts of the very best of the sector’s students and tutors. 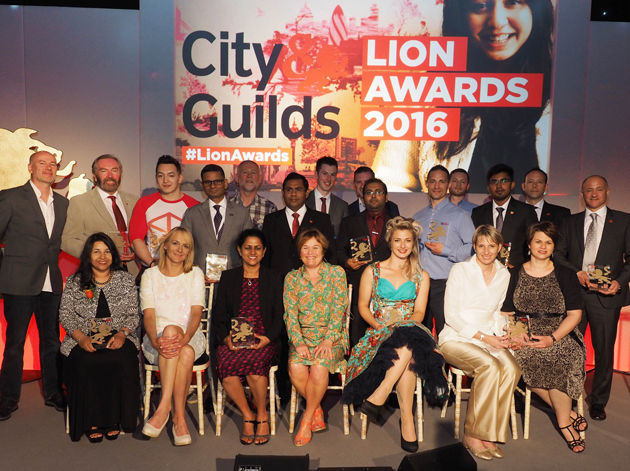 Dubbed as the “Oscars of skills education”, the Lion Awards was the culmination of the annual City & Guilds Medals for Excellence programme. Kirstie Donnelly, managing director at City & Guilds, said this year’s nominees and winners demonstrated a “wealth of talent” in FE and skills who made her “incredibly proud” of their achievements and dedication. More than 200 nominations were submitted across the five categories of Tutor of the Year, Outstanding Achiever of the Year, Apprentice of the Year, FE Learner of the Year and Employee Learner of the Year. Michael Felse from the Professional Skills Academy, Salford, took home the award for tutor of the year. A City & Guilds spokesperson said Mr Felse helped more than 200 health trainers achieve their qualifications, who meet the needs of more than 1,000 clients in communities every year. He was also awarded an Honorary Membership of City & Guilds for “outstanding work” that involved collaboration with health and cabinet ministers. Outstanding Achiever of the Year was picked up by Gary Doyle, a student at Newry & Kilkeel Institute of FE, Northern Ireland. Since starting a level two diploma in plumbing course in 2011, Gary has gone on to represent the UK at the WorldSkills in Sao Paulo Brazil last year, where he won a gold medal. Next up to be honoured was India Ratcliffe, the Apprentice of the Year from North Lancs Training Group (NLTG), Accrington. The spokesperson from City & Guilds said that since taking a level three NVQ diploma in upholstery and soft furnishings, India has achieved an “extremely high” level of skill to meet not only modern techniques but also to specialise in traditional techniques that are “rare in today’s upholstery trade”. FE Learner of the Year went to Daniel Kearney of Kerry ETB Training Centre, Republic of Ireland. Daniel had spent 20 years working in menswear before being made redundant and enrolling on a diploma in media techniques (radio) in 2014. He has since produced his first independent documentary in collaboration with RTE Radio 1, for which he was given a rating of 4.2 out of 5 by the broadcaster’s rating system. And lastly, Alexander Fu Lam Chan from Professional Skills Academy, Salford, was awarded Employee Learner of the Year. Alex enrolled onto an NVQ level three gym instructors and personal trainer’s course after university and achieved subsequent qualifications in life coaching and diet and nutrition. The City & Guilds spokesperson said that Alex not only achieved his certificate, but helped the awarding organisation to identify a new “thematic community of potential candidates” for the level three qualification.